As a subsidiary of Sinochem Corporation, Liwei PVA is the biggest manufacturer of PVA polyvinyl alcohol,PVA fibers in China. 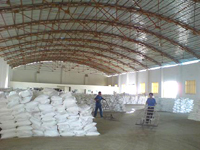 Liwei PVA is one of the top 10 PVA factories and the top 100 strongest enterprises in anhui province.In 2005,Liwei PVA is evaluated as advanced and high technical company. Sinochem Corporation was built in 1971 and started production of PVA polyvinyl alcohol since 1978.With registered capital of 14 million RMB and total asset of 700 million RMB, Liwei has grown up as the most competitive and prosperous company in the field of PVA production.In 2007, the total sale revenue reached 740 million RMB of which 90% is from our domestic bussiness. From 2011, we will pay close attention to expanding our overseas bussiness.